Aircel Services are being shutting down in few telecom circles of India, this update was also circulated by Aircel to its subscribers through SMS. So to continue using same number without any interruption the subscriber will have to port out number to other operator, so to port out to other operator you will have to generate UPC Code by sending SMS PORT <mobile number> to 1900. But what incase if you are not getting signals on your phone? This problem has been experienced by North East subscribers where they are not getting Aircel Signals, so without getting signals they would not be able to generate UPC Code to port out of the network and they would end up losing their mobile number. So in this case we have solution where you can generate Aircel UPC Code Online to Port out of Network even if your mobile number is not getting signals. Below is the complete tutorial which will explain to you in brief on how to generate Aircel UPC Code Online to Port Out of the Network. To generate Aircel UPC Code Online without network you will need your 10 digit Aircel mobile number which you want to port out and its last 5 digits SIM Number. You can find this last 5 digits of SIM Number printed on back of your SIM. And in case if you still unable to find this SIM Number than you can just find it out by using a simple app SIM Card Info, follow the below steps to find out your SIM Number. Install SIM Card Info by clicking here. Once app gets installed, just tap on the app to open it. The App will display your SIM Card Serial Number. Note down last 5 digits of SIM Card Number. 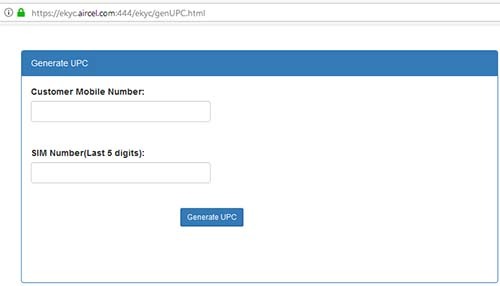 Now let’s get started with generating Aircel UPC Code Online. The page will prompt you to enter mobile number and last 5 digits of SIM Number. Enter your 10 digit Aircel Mobile Number, last 5 digits of SIM Number and click on generate UPC. Your UPC Code will be displayed on next page, now you can port out of Aircel Network by providing this UPC Code to any network operator store to which you want to port out.